YUNS is an old leather goods maker and clothing supplier. Founded in 1945, after more than half a century of honing and improving, its leather goods and clothing have been made goods and supplies for hundreds of brands and a few luxury brands. Now he is selling his well-made leather goods and clothes in amazon to keep up with the pace of the new era and the age of e-commerce. Good news for American consumers. Dimensions: 13.7" x 11.8" x 7.4" (inches). 100% Money Back Guarantee if not satisfied send it back for a full refund withing 30 days of purchase. √Advantage: Magnetic buckle to closure.This large tote can accommodate folders, A4 files, books, iPad, cosmetics, cellphone, charger, water bottle, wallet, lunch box and more. √Dimensions: 13.7" x 11.8" x 7.4" (inches). Easy to carry all your daily item. 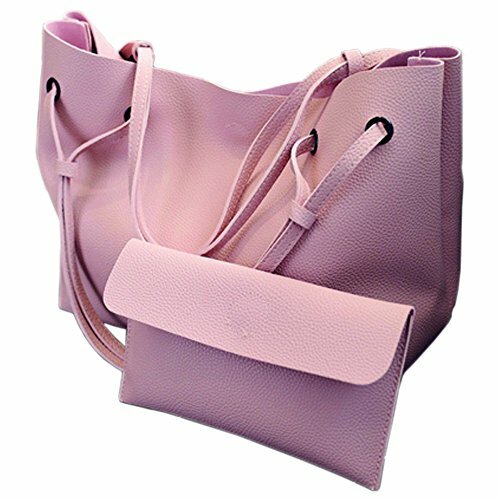 √Material:High Quality PU leather handbags shoulder tote bags;High strength hardware. Durable and strong. √Design: Elegant and simple style with a small bag which can remove. The small can contain your money or something small. √Occasion: Elegant high-end design goes well with any outfit in any occasions like work, business, dating, Daily, travel, school and you will feel comfortable to wear it. If you have any questions about this product by YUNS, contact us by completing and submitting the form below. If you are looking for a specif part number, please include it with your message.